Pinterest is one of the best social media platforms for real estate agents. Because its functionality revolves around theme-based image collections, all of your images of homes for sale, real estate interiors, real estate exteriors, different types of architecture, and numerous other real estate-related items are perfect for sharing on pinboards and getting other users to “Like,” “Comment,” or “Repin” your images. If you’re a real estate agent who regularly uses Pinterest to post great real estate photos and drive traffic to your real estate website, you’ll be very excited about the most recent release from the trendiest social media darling around. Just launched today (3/13/2013) is “Pinterest Web Analytics” which now provides account owners the ability to check out in-depth data relating to how many people saw their pins, how many people clicked onto their website from Pinterest, and how many items on their site have been pinned most frequently and most recently. 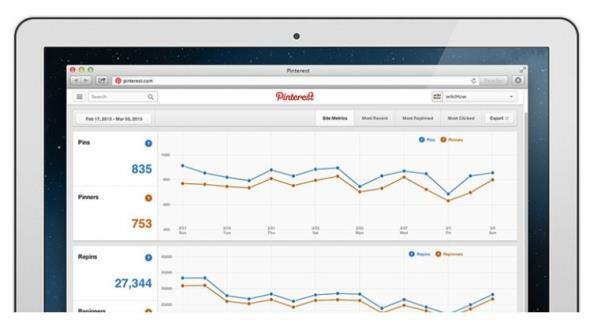 Pinterest has also provided a video tour for users to learn about all the great features of Pinterest Web Analytics and guide you through how to maximize the use of this great new marketing tool. There’s no denying that Pinterest was already among the hippest social media sites out there, but with the recent launch of Pinterest Analytics, it would also appear that Pinterest’s owners are very serious about overtaking Facebook as the most mainstream social media site as well. Just last November, Pinterest announced that businesses will have the opportunity to setup accounts on the site, which now seems to have been a precursor to launching Pinterest Web Analytics. For now, Pinterest doesn’t have any revenue-generating advertising on the site, but as large-scale companies continue to use the site to promote products, and with the emergence of analytics tools that document the value of Pinterest accounts, one can only assume such money-making features are sure to come at some point. In September of 2012, Pinterest edged out comScore’s Top 50 Web Properties with an estimated 25.3 million visitors. But with the continued effort of Pinterest developers, you can bet that ranking will continue to climb over the coming months and years and Pinterest really will become one of the top social media sites in the world. Joe Heath is a graduate of Indiana University and also holds a Graduate Certificate in Real Estate Development from Drexel University. After working as a Market Research Associate and writing published Market Snapshots for Hanley Wood Market Intelligence in Chicago, Joe now works as a Web Marketing Specialist and is a managing partner at Real Estate Web Creation, LLC.